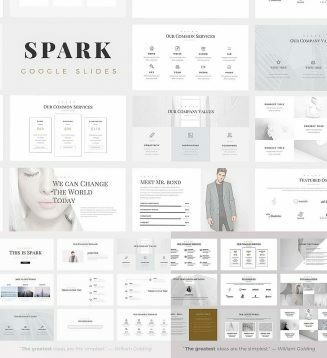 Set of 60+ google slides. Present your works in a professional and clean way with Spark Minimal Google Slides Template. This is a simple, contemporary but powerful design that includes creative photo layouts, infographics, tables, vector icons, maps, diagrams and tons of great features to show your work and your company profile on another level. Tags: corporate, creative presentation, flat design, google slide, infographics, minimalist, pptx, simple, slide.